This story reflects the motif of Cialdini, his scholarly research and his books: too often people make incorrect, inappropriate or insufficient decisions based solely on one fragment of superficial information. I read Influence: Science and Practice before I read its predecessor Influence: The Psychology of Persuasion, so I’ll choose to review Cialdini’s second book before his first book. In this review, I’ll focus on explaining the difference between the two books. Many believe they are merely the same book with different titles. Indeed, the content of the books does repeat itself, including the story that leads this review. Still, there are important differences and I’ll highlight here. For the basic content that appears in both books, I recommend you read my review of Influence: The Psychology of Persuasion. First, let’s reiterate some essentials. Cialdini, a well-respected Regents Professor Emeritus of psychology and marketing at Arizona State University, has published peer-reviewed studies since the 1960’s. He has become the guru of the science of persuasion and a favorite author of those interested in marketing. While Influence: Science and Practice covers the same material as Influence: The Psychology of Persuasion, it addresses the subject matter in more depth and in a definitively scholarly format. Think of Influence: Science and Practice as a more of a textbook version the pop-culture style of Influence: The Psychology of Persuasion. In other words, if you want a light airy read that goes quickly and is easy to pick up, read Influence: The Psychology of Persuasion. On the other hand, if you demand the intellectual support of scholarly reference, then read Influence: Science and Practice. That being said, it is reasonable to read both. Now, about those differences. Influence: The Psychology of Persuasion contains 213 citations in its bibliography. Influence: Science and Practice, on the other hand, offers 359 such references. Of course, the first book has a dozen or so pages of chapter footnotes. I don’t like chapter footnotes that aren’t at the bottom of the page on which the footnote references. 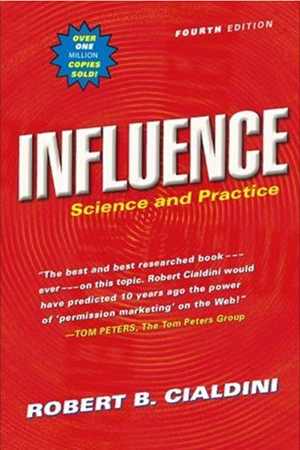 Although Influence: Science and Practice, has fewer footnotes, at least Cialdini puts them at the bottom of the page and doesn’t aggregate them at the end of the book. Other than that, the only other difference lies in the updating of the general content (and some minor editing). For example, in the earlier book Cialdini quotes Citicorp Chairman Walter Wriston. Wriston, who died in 2005, ended his role as Chairman in 1984 and Citicorp is now called Citigroup. In the later book, Cialdini removes that quote and instead references Bill Gates. Contrary to Cialdini’s general philosophy, Influence: Science and Practice is one book you can judge by its cover. It really is different – and I would say better – than its ancestor Influence: The Psychology of Persuasion. But, rest assured dear reader, both are quite dissimilar – in ways that might just surprise you – from Cialdini’s more recent effort, but you’ll to read my review of Yes! 50 Scientifically Proven Ways to Be Persuasive to discover that unexpected difference.